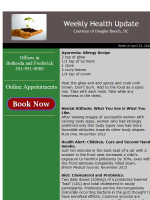 Archive of previous Weekly Health Update Newsletters. 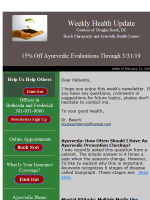 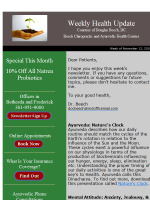 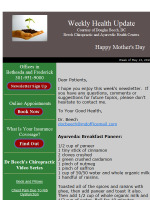 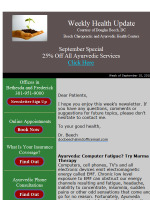 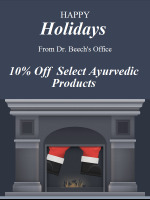 Dr. Beech's Weekly Health Update Weekly Health Update Courtesy of Douglas Beech, DC Beech Chiropractic and Ayurvedic Health Centers 15% Off Ayurvedic Evaluations Through 3/31/19 Week of February 11, 2019 Help Us Help Others Offices in Bethesda and Frederick 301-951-9000 Online Appointments What Is Your Insurance Coverage? 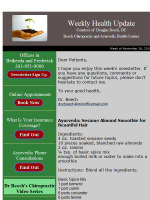 MD United States Join our Mailing List!